If you’re like most people, cleaning your gutters is probably low on your list of priorities. However, ignored gutters can lead to serious and expensive issues, which is why it’s important to hire a professional gutter cleaner in Pakenham. Overflowing gutters can be dangerous for the foundation of your residential or commercial property. After autumn brings in a collection of leaves and debris, the heavy wind and rain of winter creates the perfect recipe for disaster, with blocked gutters quick to overflow. When rain can’t make it to the main drainage area, gutters can rust, flood and leak, eventually causing damage to your roof and the structural foundation of your home. LeafVac is ready and waiting to clean your gutters before any damage can occur. Our fully qualified gutter cleaners arrive at your property fully insured and ready to tackle the job quickly and safely. 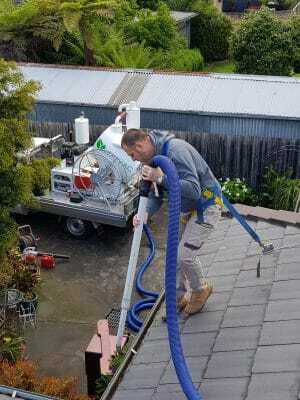 We use high powered, heavy-duty vacuum extractors to clear your gutters of all foliage, rubbish, dirt and debris so water can flow through effectively and protect your home from serious water damage, while also approving the aesthetics of your property. Contact us on 0455 488 837 and book LeafVac to take care of your professional gutter cleaning in Pakenham for a reliable service you can trust.